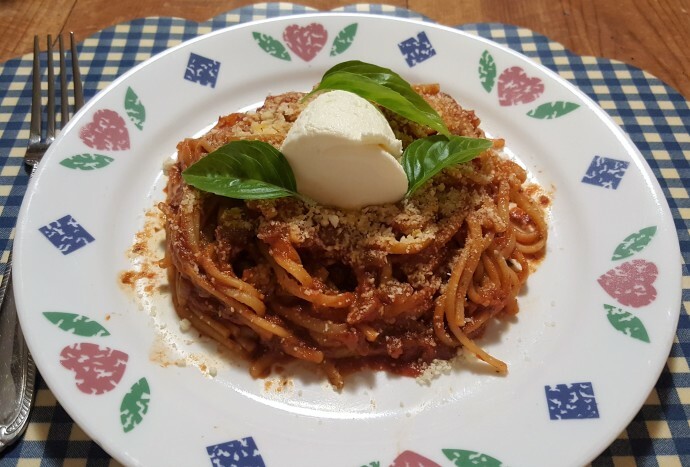 Dinner on the fly, no problem, this One Pot Instant Pot Pressure Cooker Quick Spaghetti Dinner and Homemade Sauce is sure to please. 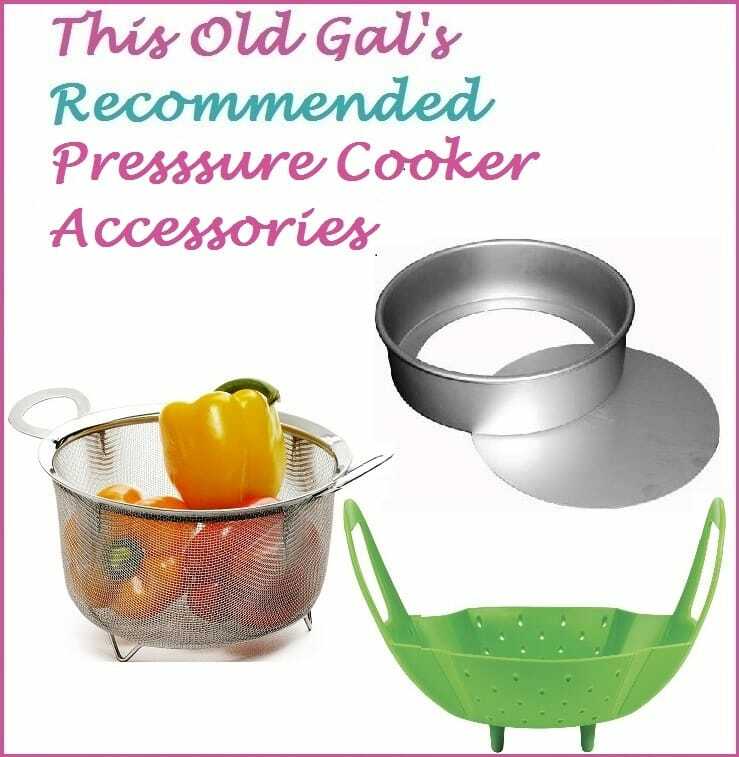 It’s so easy and takes less than 10 minutes once your Pressure Cooker comes to pressure! Make this Pressure Cooker One Pot Spaghetti Dinner and have dinner on the table in less than 30 minutes. If you want to use a jarred sauce rather than take the extra few minutes of making a homemade sauce, no problem, it’s so easy. If you prefer meat with your pasta, try my Pressure Cooker Beef and Macaroni, which is also a one pot meal and very popular! If you don’t want to make your own sauce, I’ll tell you how in the notes section below. But really, this recipe is so quick, easy and painless to just make your own homemade sauce, you won’t want to use a jar This sauce will taste like it has been simmering the entire day! Make sure you also are preparing my delicious Air Fryer Garlic Bread Buns, so you can sop up all the delicious sauce. 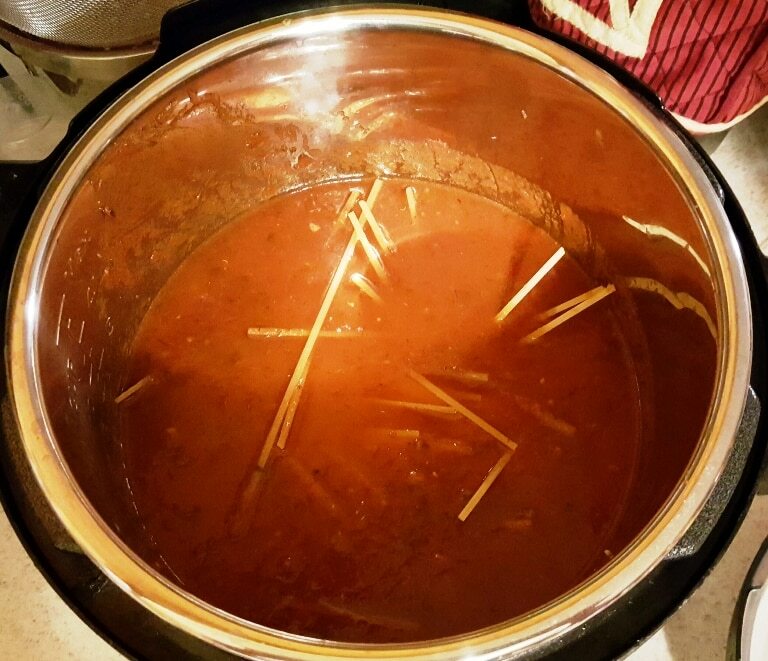 If you want ground beef/turkey, sausage, meatballs, etc., in your spaghetti, check out my Pressure Cooker Beef & Macaroni recipe (or, just brown your meat in a bit of oil and continue on with this recipe). Use the Sauté or Browning function on your Pressure Cooker and allow the cooking pot to get nice. Heating the cooking pot before adding any fat, helps make the pot non stick. Sauté the onions for two minutes and then add the garlic and sauté one more minute. 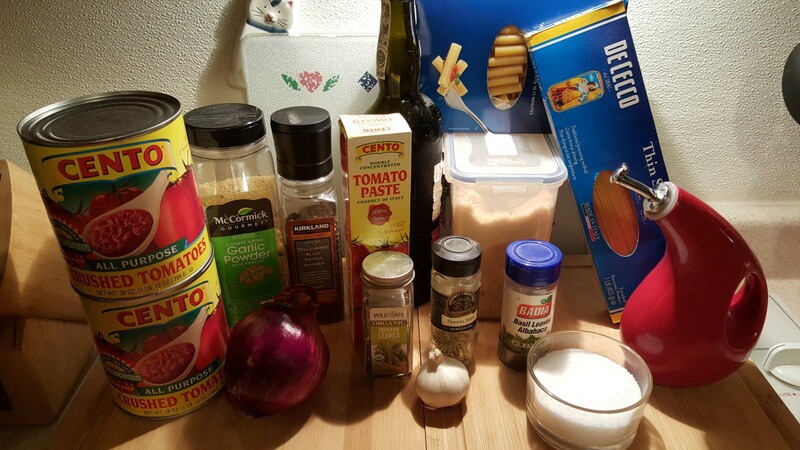 Add in the rest of the ingredients, including the spaghetti or pasta and close the lid. If you want to add in vegetables, like zucchini or carrots, chop them very thick and add them in when you add in your pasta. Spaghetti noodles WILL clump a bit, but just take a fork and break them up and they will be fine and perfectly cooked. 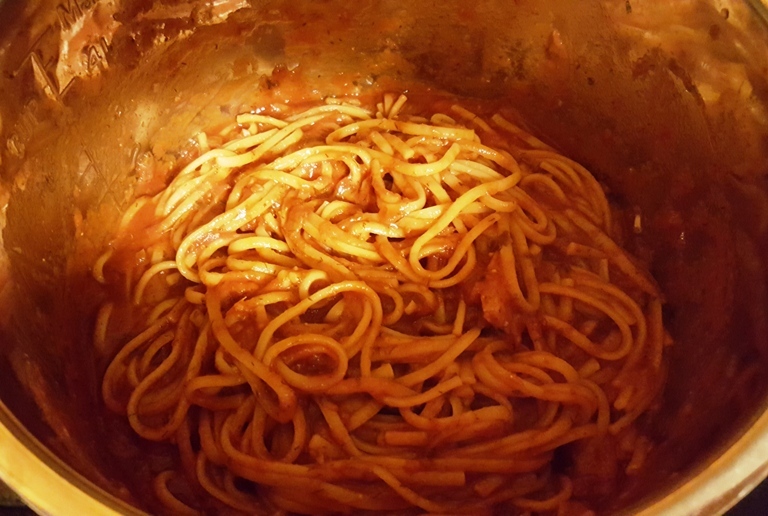 If you just want to make a pot of sauce, please see my Pressure Cooker Spaghetti Sauce. If you would like to make this recipe with jarred sauce, check out my Pressure Cooker Soccer Mom Spaghetti and Meatballs recipe. Don’t forget Air Fryer Garlic Bread Buns, to get every drop of the sauce. ¼ cup Red Wine/Cabernet a good Cabernet! Push Sauté or Browning function on Pressure Cooker. Allow it to heat and then add oil. 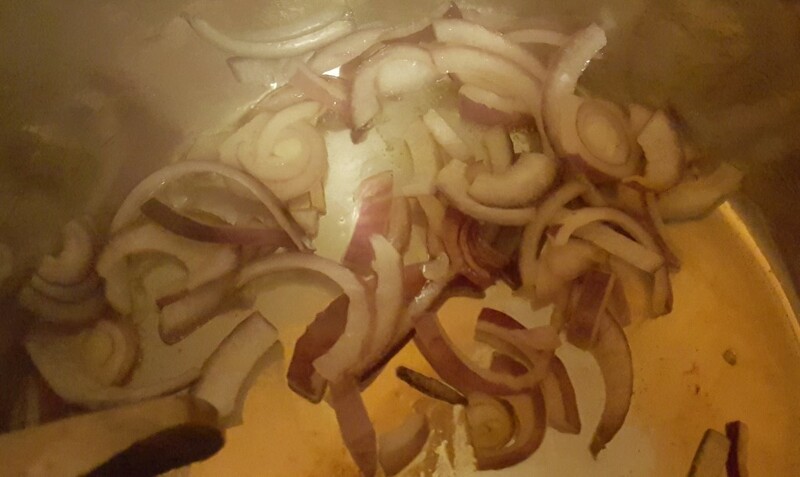 Add onions and sauté for 2 minutes. Add garlic and sauté for 1 more minute. Lock on lid and seal pressure valve. Cook on High Pressure for 5 minutes. When Beep sounds, allow a 5 minute Natural Pressure Release, then carefully release the rest of the pressure. If using Rigatoni or another sturdy pasta, cook for 6 minutes. The general rule of thumb is to cook the pasta for 1/2 of the time, minus 2 minutes, erring on the lowest side, indicated on the package. PIN this Instant Pot Pressure Cooker Quick Spaghetti Dinner! This recipe looks fantastic! On step 11 do you just reseal and let sit or do you cook on high pressure for 5 minutes? I am new to IP cooking. I attempted pasta the other night and it was mushy. Thanks for the compliment. There is no step 11, so I am not sure what you are asking. I am a little unsure of when you add the spaghetti noodles. Do you put them in with all the ingredients or after you cook the sauce for five minutes of high. Do you put the spaghetti in raw or cooked if it goes in after you pressure cook the sauce. Looks great and want to use this on our sailboat. Everything gets cooked at once in the same pot. After you add the sauce ingredients, add the pasta and the liquid. The noodles will stick together a bit, but just pull them a part with a fork after opening the lid. One jar of sauce and one and one half jar of water or broth. Mine came out hot, spicy and a little sour to taste. I admit I’m not an experienced cook, but I thought I followed the recipe. Maybe that’s how it’s suppose to taste and I’m just too used to jarred pasta sauce. I am not sure why your sauce was sour and spicy. The sauce should taste like sauce that was cooked all day. Did you add the wrong spice, by accident? Mine came out perfect. Thank you, Jill! I used a little more brown sugar than called for, maybe as much as 2 tsp. I don’t use red pepper flakes, due to personal preference, and didn’t have either black pepper or fennel seeds, but for my family this was perfect! Maybe you misread the 1/4 tsp of red pepper flakes, and put in more? I made this the other night and it was AMAZING!! Today I brought my IP to the Engine House to cook for my brothers! 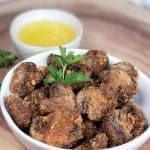 I’m wondering if you can double this recipe? Do you think the times would remain the same? You certainly can double the recipe. The cook time will be the same, but reduce the liquid by about 1/4 cup. Thanks so much for the kind words and thank you for keeping the city safe! I made this the other night and it was AMAZING!! I brought my IP to the fire station to cook for my brothers tonight, but I need to maybe double the recipe. Do you think the times would remain the same?? If not, how long do you think? I have a Smart 60 duo. Thank you so much for the compliments. The time should be the same with a double recipe, although it may take longer to get to pressure. To be on the safe side, cook for one minute less, as you can always simmer after the fat, if need be. So I doubled it, and everything worked out…. Took FOREVER to come to pressure. It ended up needing a little more cooking to get the noodles just right. I didn’t see your reply until after it was started, so I went with a full double recipe. The guys loved it! I think 6 minutes at pressure would be perfect. Made with jarred sauce and added 1 1/2 jars of water as suggested. Turned out very watery and not very flavorful. Spaghetti was perfectly al dente. Will have to try your homemade sauce recipe next time. I am glad the spaghetti was at least al dente. The homemade sauce ill give you a homemade taste. I followed this almost to the tee. It turned out fabulous! I’m a believer! Thanks for the recipe and the directions. Almost to a tee, uh oh, what did you do differently? I bet it will be fabulous. Let me know. You can use another liquid to make up for the amount of red wine, but you won’t get the delicious depth of flavor that red wine adds to red sauces. Hi I just got my pressure cooker and am a total newbie. 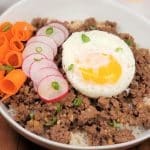 How would I adjust this if I wanted to use whole wheat noodles and added some ground turkey? I’m trying this recipe out and wasn’t sure if after the initial sauté step you have to change to manual mode to get it to high pressure? In sauté mode I wasn’t able to change the time or pressure. This is my first day using it! Thanks for the help! In the recipe it calls for diced tomatoes, paste and sauce, but I see crushed tomatoes in your picture! Do you use either, or… I like sauce made with crushed tomatoes so it caught me eye! I just got my first IP and haven’t had much luck with making something good with it. We have gluten sensitivities, can we use brown rice pasta instead? would I need to reduce the cooking time? This has quickly become our favorite way to make spaghetti. So easy, quick and better for you than jar, store bought sauce. I really – really love this recipe. My family has two helpings of this recipe every time I make this. They even ask for more for lunch the next day. Highly recommend! Thank you for sharing. I tried this two nights ago and it was perfect. Fantastic instructions, thank you so much. Thank you. So glad you enjoyed your meal. I followed this recipe to a T, I was really excited to use this because I already shared the recipe with a friend at work who got an IP for Christmas! I used Cavatappi pasta, so set my time at 6 minutes on high. We actually all took a nap shortly after I set this up, so it went about half an hour on the keep warm cycle, but it is just perfect! When it was completely done, I added a package of large curd cottage cheese, and diced up some vegetarian patties I had made this week. 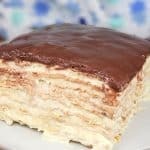 It is incredible, my husband has already asked me to make it again. This is a hit with my family! Thanks so much for the recipe.I will make this again, frequently! Susanne, you scared me a “to a T,” because it is usually prefaced by I had a failure and I followed this recipe…… Hehehe 100% of the time when I see that, they didn’t. Actually really following to a T like you did, yields great results. So funny you added cottage cheese. I do that too! So good. If adding jar sauce, what size Do you use? I made this tonight for my family and it turned out wonderful! I browned hb meat with frozen bell pepper and onion mix on saute..drained the fat…I was lazy and used jar sauce 24 Oz so I added 1full jar and 3/4 jar of water for 5 mins. Thank you so much! Next time I’m trying your homemade pasta sauce ???? I’ve made this 5 times now and it’s been perfect every time. I start with 1lb ground turkey and use a jar of good quality organic sauce. I also add 1 tablespoon of tomato paste and a little extra red pepper flake. 4 mins and 5 mins NPR is the perfect time for us when using gluten free pasta. I serve it with a big salad and this is enough to feed a family of four with leftovers for one lunch the next day. Thanks! I just got my instant pot today and I made this tonight exactly as stated except eliminated the fennel because I’m not a big fennel fan. This was AMAZING! Seriously probably the best spaghetti sauce I have ever eaten. The noodles stuck together a bit as stated but I just stirred it and they came apart. I will definitely be making this again! Thank you for the recipe. To clarify – if using your sauce recipe do I include the 15oz of tomato sauce as well? or is the 15oz tomato sauce if I’m skipping the sauce recipe and using jarred sauce? I made this a few days ago, exactly according to the recipe, with the addition of a small bag of frozen meatballs right on top of the other stuff. It was PERFECT! I love the fact that you can rely on TOG’s recipes to have perfectly balanced seasonings! I haven’t tried yet but knowing ahead of time that my husband doesn’t care for the jar sauce because of too much tomato-based. What would you suggest I do, if anything to make this be one he likes. Delicious. I added a yellow squash shredded and squeezed, a half green pepper diced and a half red pepper diced. Because I had a 17.6 oz. packet of spaghetti, I added about a 1/2 cup of diced tomatoes that I had on hand and another quarter cup of water. I used the Better than Bullion mixed into my water. I had some issues with my noodles not all cooking at the same speed. Had to add 3 minutes after the first round and NPR. I had added frozen meatballs on top, maybe that changed the dynamic?? The sauce was fantastic. Easy peasy. Just got my instant pot, looking forward to trying your recipes. Just made this tonight and it was yummy! Thank you for a great recipe. 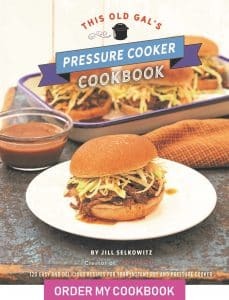 Your recipes for QUICK SPAGHETTI DINNER and PRESSURE COOKER SPAGHETTI DINNER sound like they are delicious. Could the spaghetti dinner recipe use meat as well and start by browning ground beef and then adding rest of ingredients. Would all of the other ingredient amounts remain the same? Well, hey! That worked out! I used whole wheat pasta, browned 1.25 lbs. ground turkey on saute, and the rule-of-thumb pasta formula. This is only the third pasta dish I’ve tried in the IP, but it’s the first one where the pasta hasn’t been over-cooked. Hooray! If I have a bunch of frozen homemade sauce, do I have to adjust the water that I add /as opposed to using jarred sauce)? Absolutely delicious! I hoped it would be good but didn’t expect this good! And thank you for a recipe that didn’t take a jar of sauce! I searched pinterest for instant pot spaghetti and yours was the only one without jarred sauce! I did add ground beef. Oh such a good recipe! I don’t think I have ever commented on a recipe before, but I am so excited about this recipe I had to review it! I just made it tonight after 7 hours of baseball and softball games. It came together super quickly, even with defrosting ground beef and sautéing it in the instant pot. 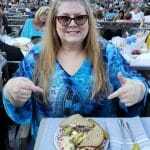 And the best part was that my whole family, including a very picky son, and 100% Italian picky eating husband loved it! My daughter and I aren’t as picky and we loved it too! I will definitely be making this again! 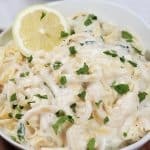 How would I do this with homemade pasta which only takes about 2 minutes to cook anyway? Both times I’ve made this it has burnt. Could it be because I use spaghetti sauce instead of tomato sauce? This Old Gal, thanks so much for your recipes and tips. I like your website. Still, I would like to know the ratio. Here, the tomatoes add water also. Are you using a large or small clove? Makes a big difference. So good! I used whole wheat Rigatoni and added ground turkey. Delicious, thanks! Thank you so much for publlshing this recipe. I have been interested in making spaghetti in the Instant Pot, but really didn’t want to use a jar of sauce if I could help it. Well, I made the recipe but only used half the ingredients (plus a half pound of lean ground beef) because it’s just my husband and myself. There were NO complaints from husband (for a change) and I also thought that it tasted really delicious! Now I can have spaghetti and meat sauce, made with the convenience of the Instant Pot, and no yucky pots and colanders from which to wash (and scrub!) that yucky pasta residue. Tried it. Used spinach noodles and added 1 lb lean ground beef (browned on stove top before adding to pot). Got the “burn” message. Had noodles and tomatoes stuck to the bottom. Dumped it all into my spare pot, added another 1 cup water. “Burn” again. It’s edible. Not even bad. No clue why it burned though. Just want to compliment you on this recipe. I love spaghetti, and while my mom’s spaghetti was always good, this blows it out of the water. My wife and daughter love it as well. This is delicious !!! The only change I made was , I halved the pasta.. A whole pound of spaghetti would have been way to much. I used half a pound and broke it in two and the sauce to pasta ratio was perfect. Delicious flavor to sauce. I love how quick and easy this was to make! And that it was homemade instead of canned sauce. My family ate it right up. Was looking for something quick on a Sunday being that it was already 830pm. When I looked at the ingredients, it was perfect. I actually do a sauce on the stove top and have learned to keep all of those well stocked in my pantry. I didn’t have any onions, and I normally use already minced garlic and just watched that for about a minute or so. My pasta was slightly undercooked but that could’ve just been me. I also didn’t have the wine, I know, who doesn’t have a stockpile of wine? I look forward to playing with this recipe some more. 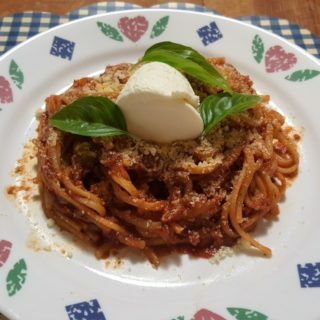 Can this instant pot spaghetti recipe be made without adding the tmatoes? No, i don’t think I’ve left this queztion before. My family doesn’t like the added tomatoes. How do I adjust the recioe if I don’t include them. Do I just adjust the liquid by adding more water? I just made this dish in my 6 qt Cuisinart Electric Pressure Cooker and it was super delicious. I followed your recipe exactly. Thank you. I am going to purchase your cook book. I changed a few things. I sautéed my onions like mentioned. Then I added my pasta. I put the pasta in different directions, so no clumping. I added a jar of sauce, a can of diced tomatoes, a small can of tomato paste, and A jar of water. I high pressure cooked for 8 minutes, and let the pressure out manually. It was a little watery, but thickened up. Since I had no meat, I added mozzarella cheese to my bowl. I was looking for the Instant Pot recipe for a jar of sauce and spaghetti noodles so my son can make it. Any suggestions. This looks great! I was wondering if you have ever used rice pasta and how it turned out? I wondered if your tip for cooking the pasta (time-wise) would be the same. Thanks! Can’t wait to try it!